This set is a complete skincare regimen that provides every step you need for healthy, beautiful skin. This exclusive set is only available during our August Erase Paste launch. Supplies are very limited. 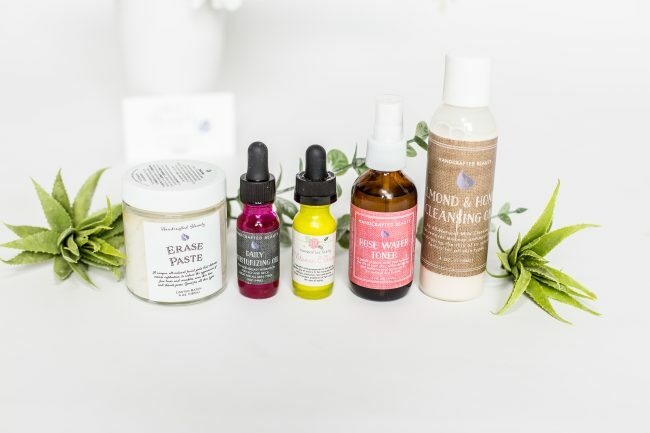 Handcrafted Beauty is offering 5 essential skincare products, full size, at a discounted price. Our skin thrives with a consistent skincare routine that contains all-natural ingredients that deeply nourish it. This set is designed for all skin types and sure to deliver undeniable results. Handcrafted Beauty’s All-Natural Almond and Honey cleanser takes an oil base and combines it with Organic Castile Soap and Organic Raw Honey to produce a creamy, gentle cleanser that removes makeup and impurities without throwing your skin out of balance.You are going to love how soft, radiant and supple your skin feels after each use. Cleanse AM & PM daily. This gentle floral water, balances the PH of the skin, while delivering intense hydration and antioxidants, to protect from the signs of aging. Improves the overall tone, texture and reduces the size of pores. Apply with cotton pad or ball in the AM & PM daily after cleansing skin. A topical Vitamin C serum is one of the most important products in your skin care arsenal. Loaded with antioxidants, Vitamin C not only works to prevents environmental and UV damage to your skin, but also stimulates collagen and repairs damaged cells to reveal healthy skin that glows. Apply in the AM after cleansing & toning skin. Rich in hydration and effective to reduce and prevent the signs of aging. Skin is left smooth, fresh and youthful looking. Apply AM & PM daily. An innovative skin treatment for youthful glowing skin. Formulated to deeply exfoliate and remove dull cells, while delivering optimal nourishment for healthy new ones. This effective treatment helps to Erase fine lines and wrinkles, acne scarring and age spots. I bought this set at the last launch of erase paste for 2017 and love them. I have since reordered the products I ran out of. Love the way they make my skin feel and look. Thanks for making good products and affordable too!